In her music video, Trumpet Grrrl skateboards to a second-hand clothing boutique in Brooklyn with a box of her clothes. One of these items is a pair of cute girly rain boots. She trades them in for cash, and in a funny turn of multiple events, these boots get in the hands of several different owners, and somehow find their way back to our heroine. 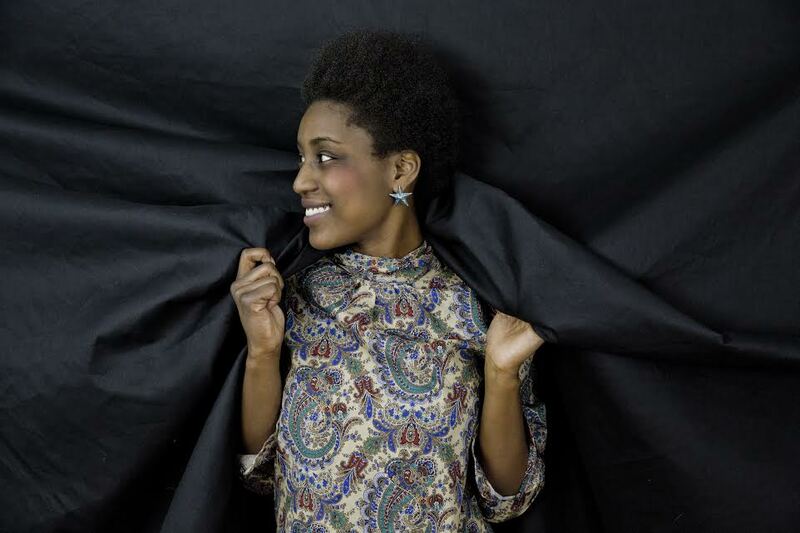 Researching her last two albums, It All Starts Here (2012) and The Basement Tracks (2011), and a track recorded with producer Matt Shane at Converse Rubber Tracks studios called “Afghan Palace”; I sensed Trumpet Grrrl developed from a newbie on the music scene to a must-be-heard talent. So, I invited her to be this month’s interview feature on Music Historian’s Hear, Let’s Listen. Trumpet Grrrl picked up the trumpet at the age of 10 and has been hooked since. Private lessons and summer camps served as the starting platform for her classical music training. In later years, the trumpeter would perform at Carnegie Hall and the National Symphony Orchestra on a fellowship. 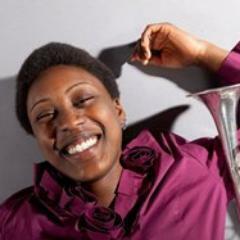 In 2008, she received a Bachelor’s of Music in Trumpet Performance from the University of Maryland, College Park. During her final months of college, Trumpet Grrrl formed the rock band La Coterie where she played keyboard, sang lead vocals and composed music. Two years later, she left the band to start her solo project. Here, she taught herself to play the trumpet and piano simultaneously. Watch her Youtube videos, and you know Trumpet Grrrl has proven herself a multi-instrumentalist. She claims that playing two instruments and singing at once provides room for varying tonal colors and harmonic motions. The challenge is the quick change of putting down the trumpet and getting her right back on the keys, which according to the musician, can lead to a fallen trumpet. During live performances though, Trumpet Grrrl says her skills creates a “wow!” factor for the audience. Trumpet Grrrl also claims that patience is one of the biggest lessons she learned over the past three years. Now, as she prepares for the completion of her third EP, Just Listen, which is set for a date in late summer or fall of this year, Trumpet Grrrl sums up the experience of making this record. Earlier in 2013, Trumpet Grrrl participated in a Twitter chat run by @GoGirlsMusic, held weekly on a Thursday, called #ggchat. Here, she inquired about companies that produced music videos and was referred to Cultured Productions. She claims the company’s investment in social media was a key decision factor. Trumpet Grrrl’s low and sultry voice and her trumpet skills blows listener’s minds. “Rain Boots,” which Trumpet Grrrl also produced with Jacoby, is catchy, and memorable, especially as it exudes a New Orleans jazz band charm with splashes of pop and soul. Enthusiasts of indie films will find charm in her music video for “Rain Boots” as they watch how much joy someone can experience in simple pleasures while living in the complicated, urban, cluttered and fast-paced landscape of New York City. This music video is bound to brighten someone’s day. 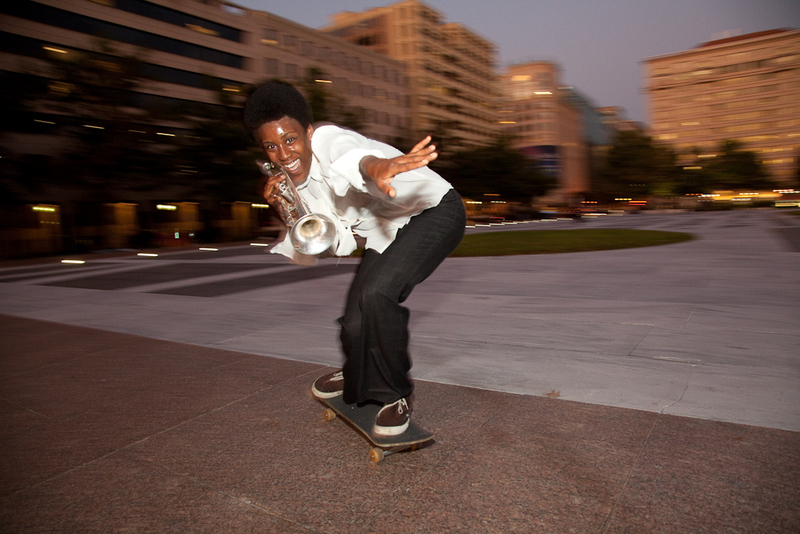 Prior to recording songs for Just Listen, Trumpet Grrrl also wrote the cheery, experimental and gospel-imitating track “Up!” from The Basement Tracks. If listeners seek a minor-key song with a cool electric guitar solo to help drive away their daily blues or mentally travel to another place, then “Afghan Palace” will fulfill this musical and emotional need. When I asked Trumpet Grrrl on what she hopes fans of her music take away from Just Listen, she responds, “Whatever feelings it gives the listener; I love hearing their various emotional responses and thoughts. It’s always relative to what they’ve experienced in life. “Since moving to NYC, I have also played on subway platforms. Nothing makes my day like the reactions I get. Some [people] will start dancing, draw pictures of me, miss their trains to listen and some just stop to encourage me to follow my dreams. It really warms my heart when I get a “thank you,” and when my music is received as a gift and brightens someone’s day. Trumpet Grrrl reminds us that consistent and constant performance, and playing an instrument or many in addition to singing, makes a good musician a memorable and well-received one. Whether the audience observing the show is passing through the subway, sitting inside a comfortable landmark performance space, or surfing on Youtube, listeners respond well to confident performers. Trumpet Grrrl finds happiness in performing, and in turn, this brings her pleasure and contributes to her development as a singer-songwriter and artist. This entry was posted in Artist Interview, Brooklyn, Independent Music, jazz, Music Video, Musical Performance, New York City, Popular Music, Social Media, Twitter and tagged album Just Listen, Cultured Productions video, producer Scott Jacoby, Rain Boots Music Video, Rain Boots Trumpet Grrrl, Trumpet Grrrl Cultured Productions, Trumpet Grrrl music. Bookmark the permalink.